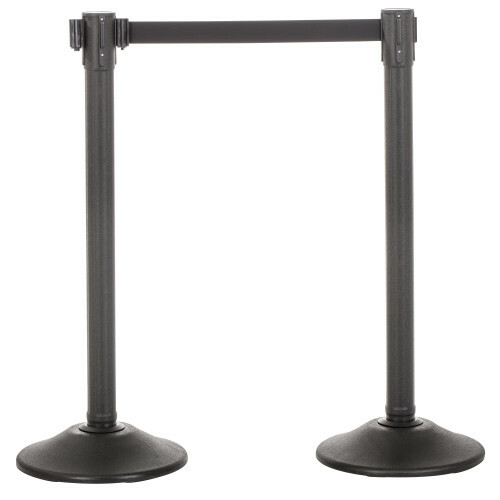 The QuikSecure style of the popular Sentry stanchion from US Weight includes premium features such as the patented Sta-Straight technology, also found in US Weight Premium Steel stanchions, a safety braking system in the retractable belt, and a prefilled Duracast base – all at an affordable price. With no tools needed to assemble this stanchion and zero worries of scratching up the post, the Sentry QuikSecure is the ideal stanchion choice for events, rentals, and any where quick and easy assembly and deployment is needed. Safely control crowds, direct the flow of foot traffic, or protect closed areas with this high-density polyethylene crowd control stanchion. Made in the United States, the Sentry QuikSecure will never lean or require maintenance due to our advanced Sta-Straight Technology. Designed with four points of contact under continuous tension plus a high-strength compression collar, this spring-tension system keeps the post upright even after extended use. This stanchion is perfect for events and rentals, featuring the innovative QuikSecure® 5-second setup and tear down that requires no tools for easy twist-and-lock assembly. The Sentry QuikSecure features a 6.5-foot retractable belt that includes a locking mechanism and a safety braking system. The belt end is compatible with most major stanchion brands allowing you to connect to the posts you already have. The base is prefilled with 17 pounds of Duracast, a very high-strength concrete, and features six non-skid, non-marking rubber feet to keep the stanchion in place. The Sentry QuikSecure is only compatible with the U2513 Sign Holder to advertise signage (sold separately). This product is backed by a 90-day warranty. US Weight, located in Olney, Illinois, delivers unmatched quality, safety, and innovation with the Sentry QuikSecure stanchion.